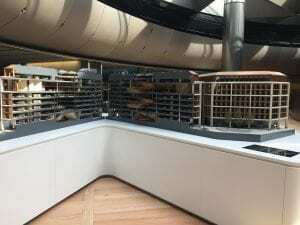 A small group of City Library staff, academics and students headed under the sun towards Bank Station on Thursday 28th June to discover one of the most recent additions to London’s list of iconic buildings. 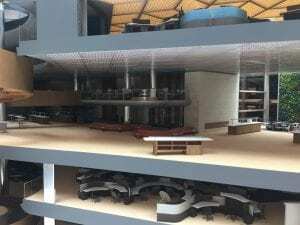 The Bloomberg European Headquarters soon came into view, and we were all shown into a gigantic reception hall. 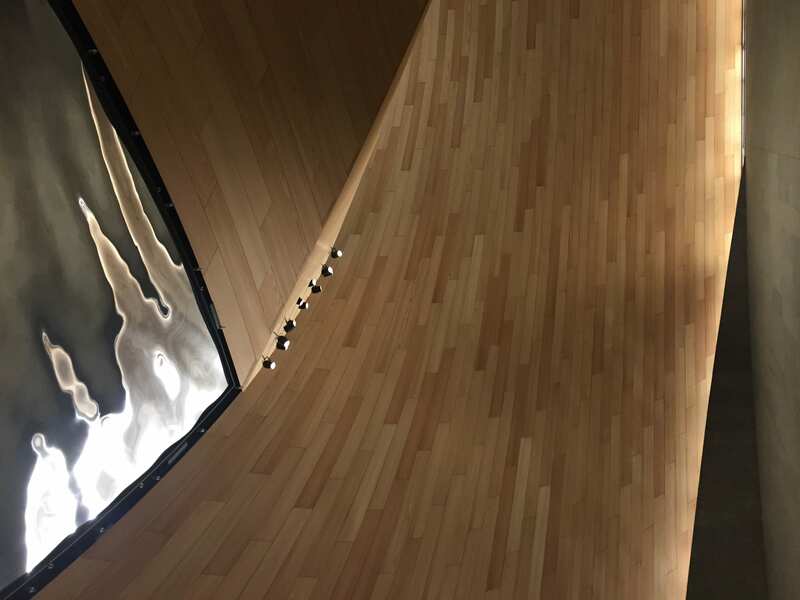 The curvy wooden hall soon led us to realize we were entering a gigantic helix – or penetrating an architectural mystery. 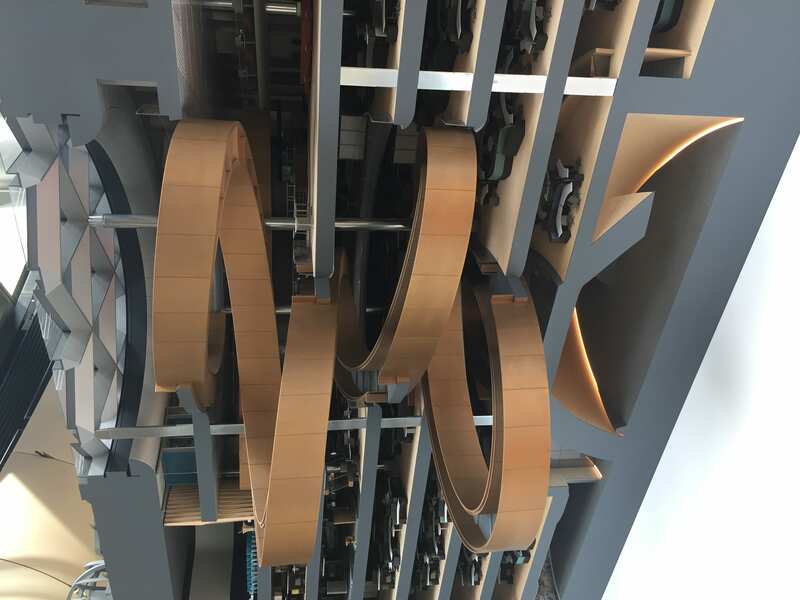 This helix is like a hidden revolving gateway that gathers people to send them in different directions around the building. Duly tagged, we were ushered to one of the many glass lifts that fly people around when they are not using the big ramp that spirals up above the ground floor helix. On coming out of the lift, we were greeted by a multi-coloured school of fish. 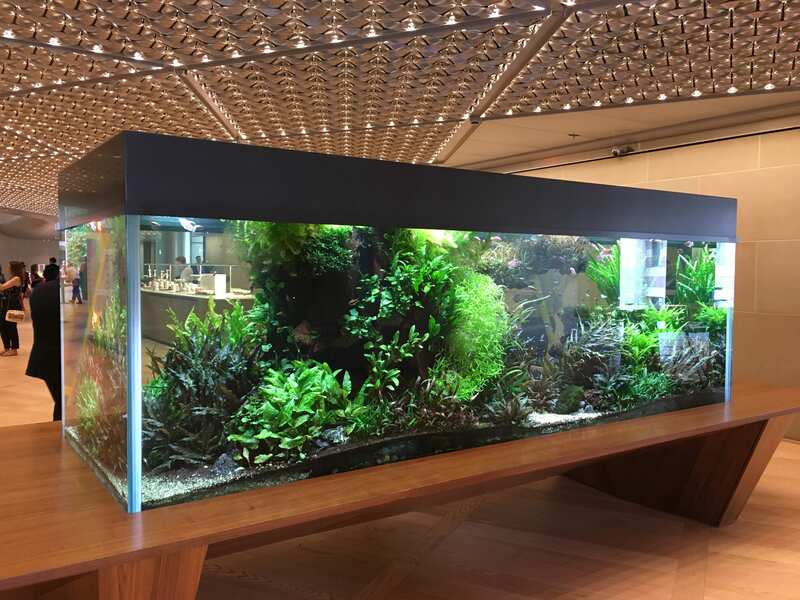 Our first stop was the pantry, a large open space for staff to relax and socialise, which includes several big aquariums. Fish have long been part of Bloomberg workforce, allegedly since Mike Bloomberg’s wife put a goldfish on his desk at home to get him to look away from the computer screen. 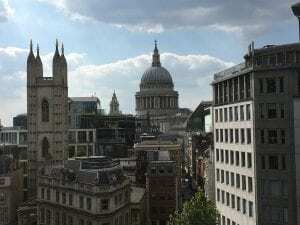 Our guide happened to be detained in a meeting, so we indulged ourselves into what the pantry had on offer: a stunning architectural design, a breath-taking view on St Paul’s Cathedral, and most importantly, food and drinks in abundance. Our guide then gave us more details on the building. 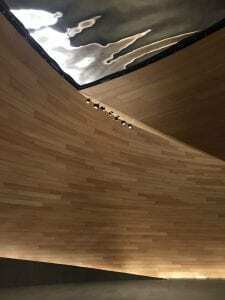 Completed as recently as last year, it was born out of a fruitful collaboration between Mike Bloomberg and Lord Norman Foster. 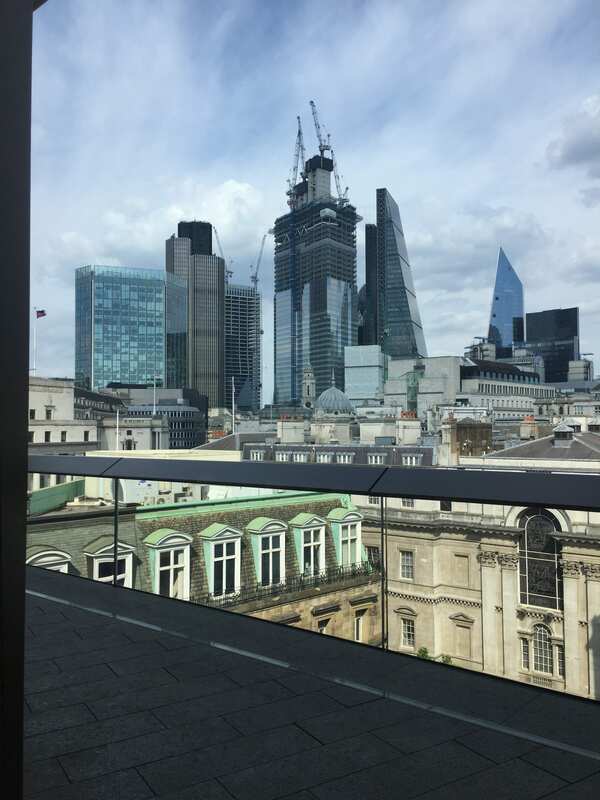 Bloomberg European Headquarters were previously occupying three different sites and this project brought them together in one area in the very heart of the City of London. Outstanding office locations are a must at Bloomberg: in New York, workspaces occupy the top of a skyscraper, in Sydney they look over the harbour. 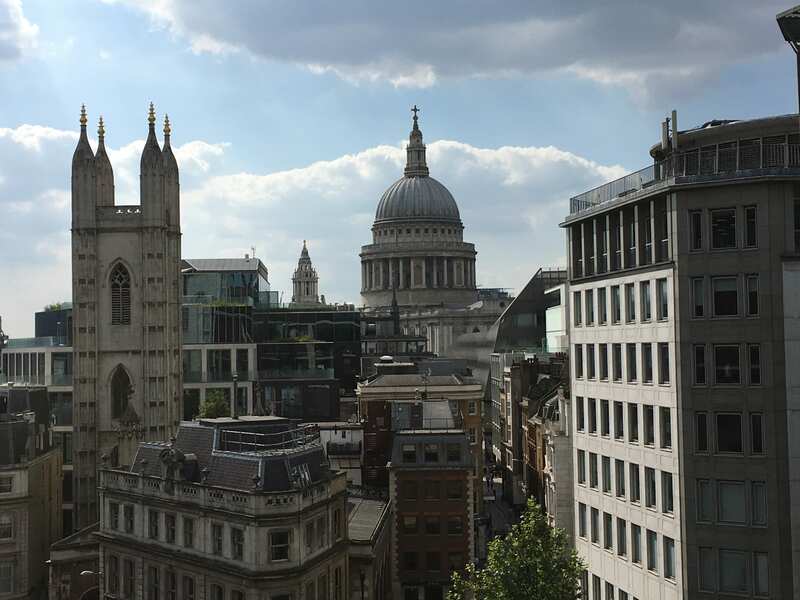 In London, staff’s inspiration is secured with one of the most beautiful views of St. Paul’s, which can be admired from both the pantry and the terrace that extends it. However much the building benefits from the location, it is also designed to benefit the area. Mike Bloomberg chose to limit its height in order to keep it within the skyline of the older cityscape around Bank station. 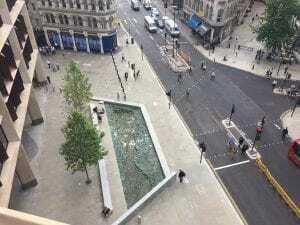 He also insisted that its size should be limited to offer some space to the public on Queen Victoria Street, a square with an artwork suggesting the long-buried River Walbrook. The building itself is divided in two by a pedestrianised dining arcade that preserves an ancient Roman travel route. It also includes a cultural site where visitors can freely admire the remains of the Temple of Mithras which stood there in Roman times. 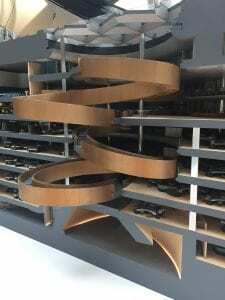 The building’s other attraction is certainly its sustainable features, the biggest ever achieved so far by a major office development. First, rainwater is used to flush all toilets as well as to tend to the needs of the big green wall in the pantry, and this brings down water consumption by 73%. Then all artificial light is produced by tiny LED light bulbs inserted into an intricate ceiling design that helps spread their brightness, which contributes to a 35% saving in energy consumption. Finally the floor, which Mike Bloomberg wanted as homely as possible, is composed of the world first magnetic floor boards, which makes maintenance work easier. The building also displays the company’s values, such as transparency and teamwork. Partitions are mostly made of glass, so that everyone can see what happens in the lifts and the meeting rooms. 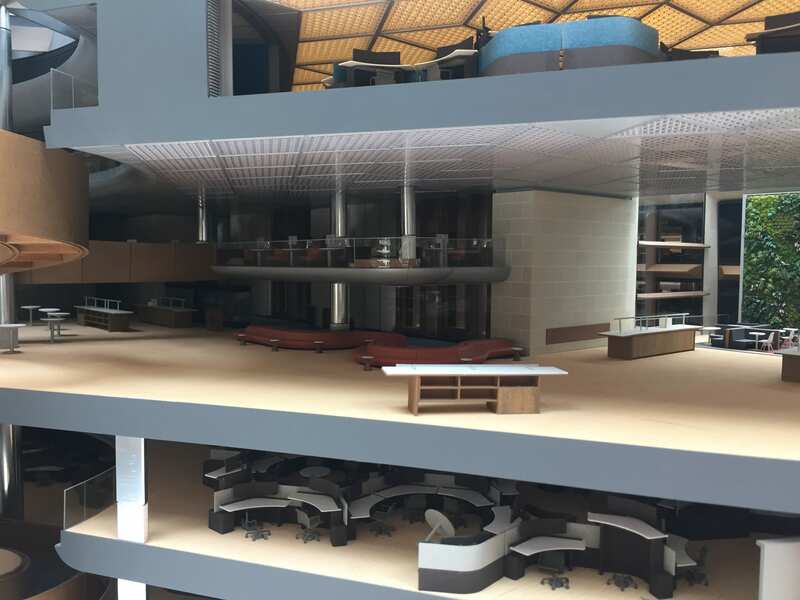 Workspaces are open plan, so that even Mike Bloomberg sits with his employees when he comes to London. The desks are not organised in the conventional rows, but in semi-circles, that favours teamwork, while enabling everyone to concentrate on their screens when they need to. The ramp that meanders through the building to connect all floors is very wide and easily accommodates impromptu meetings. In a state of awe, we were shown into the dining room, namely the office for very important meetings, which can include Prime Ministers at this level. Participants could be easily distracted by the view of the shiny skyscrapers beyond Bank Station were it not for the lights that act as microphones above the table and prevent anyone from missing out on any contribution. 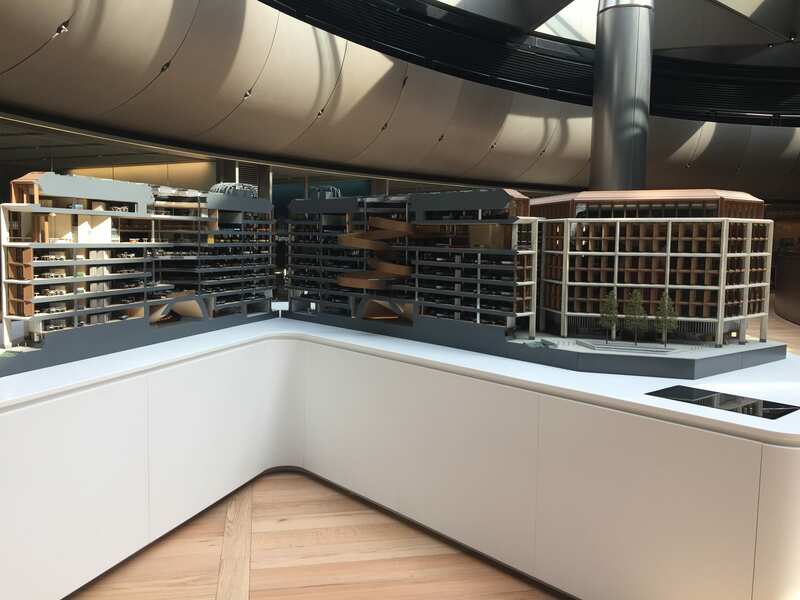 Our next stop was on the top floor, where a detailed model of the building gave us some more insights into its structure. We then walked down the ramp to the floor where Bloomberg TV programmes are shot. We silently made our way through the office space before flying back down in one of the lifts to the ground floor. 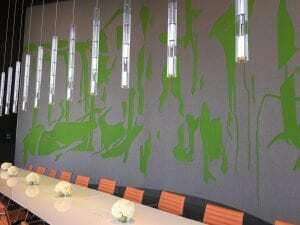 After entering a circular reception room decorated with a luminous artwork, we were told that this is the place where guests are served drinks and canapés before attending talks by the likes of Ed Miliband in the auditorium next door. 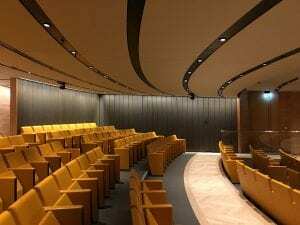 There are two auditoriums at Bloomberg and they are both used by influential people to give conferences. The ground floor one, where we were then invited, is a masterpiece of comfort and technology, where a single clap coming out of one of the fully equipped leather armchairs can be multiplied to sound like an entire audience’s ovation. After a great tour of Bloomberg’s offices, some of us took the opportunity to visit the London Mithraeum. 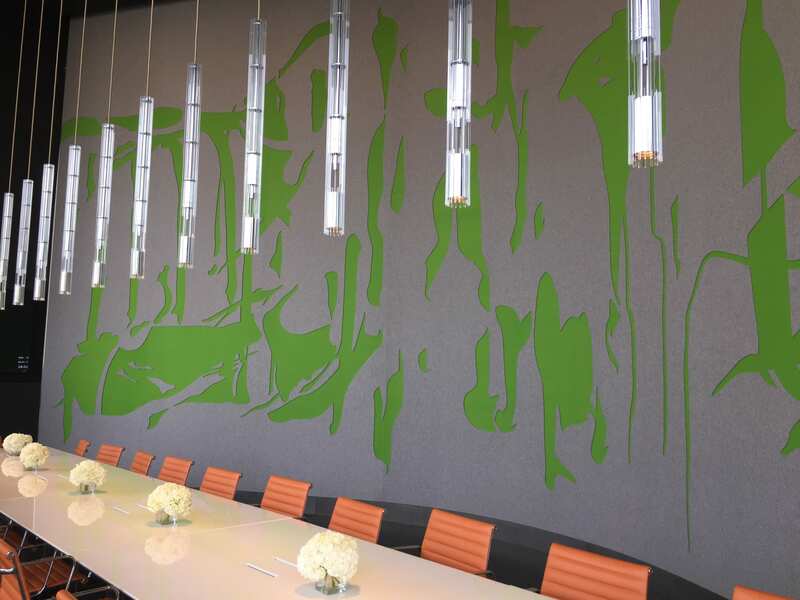 This is a space created by Bloomberg, inspired by the many artefacts dug up when Bloomberg were building their new offices. The main attraction is the Mithras temple, found in 1954 on an archaeological dig; it is one of the most impressive archaeological finds in Britain. But there are many other artefacts too, some dating from nearly 2000 years ago when London, then Londinium, was just at its beginning. As we entered the building, we were met by an art installation by artist Pablo Bronstein. 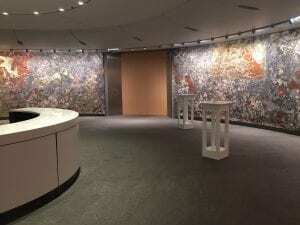 A temporary exhibition, the artwork is a 3d-rendered wallpaper that depicts a fictional London inspired by Ancient Roman architecture, as well as the renaissance and baroque periods. It is an impressive piece that immediately set the tone for our visit, a surreal mix of old and new. We were guided to a large glass cabinet full of archaeologic items found on the Bloomberg site and given iPads so we could learn about them. These were only a tiny portion of what they found. It was surprising to see how many organic items, such as leather shoes, survived. Organic items would usually perish over time, but the ancient Walbrook River gave these items just the right conditions so they were preserved instead. The most interesting items were the wax writing tablets. The Ancient Romans would write by melting wax into wooden tablets and then inscribe into the solid wax with a sharp tool. Some wooden tablets would have markings on them were people had pressed too hard when inscribing. There were examples of these in the cabinet. One of them had the Londinium name scrawled across it whilst another spoke of a debt owed. We then made our way down to the first lower floor. As we walked down the stairs, historical dates littered the walls making us feel as if we were going back in time. This floor had a few pieces displayed along with audio-visual content setting up the atmosphere for visiting the Mithras temple on the floor below. It wasn’t long before we got an opportunity to see the temple. When we walked in it was almost pitch black, the temple barely visible. When it was lit up, the temple was smaller than I expected, but held a lot of presence. I found it hard to fathom I was looking at something that was nearly 2,000 years old. Sounds of worshipping played over the speakers and filled the room, giving a feel of how the temple could have been used by the mysterious cult of Mithras. The whole experience only lasted a short time, but its atmospheric quality definitely left an impression. 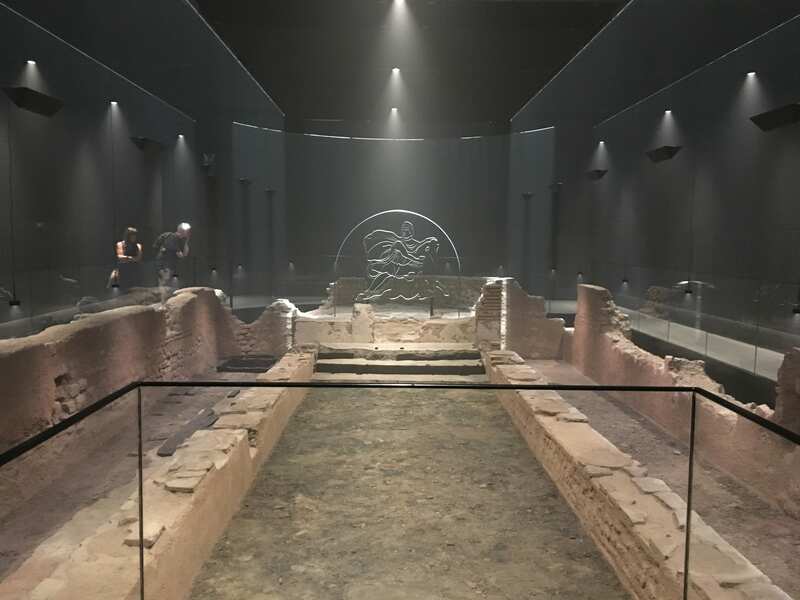 If you would like to visit the London Mithraeum, you will be happy to learn it is entirely free! However, you still need to book a timeslot. The building is impressive- and let’s not forget that all the food and drink in the Pantry was free! As for the Mithraeum- amazing and definitely worth a visit. How did you manage to book a visit to the Headquarters? I can find information only regarding the Mithraeum. Hi Laura, This visit was part of a summer training programme for staff working at City, University of London, Library. The University has contacts with Bloomberg because of its Business School, Cass. …I would like to book a tour to go with my colleagues!! Hi, this visit was part of a summer training programme for staff working at City, University of London, Library. 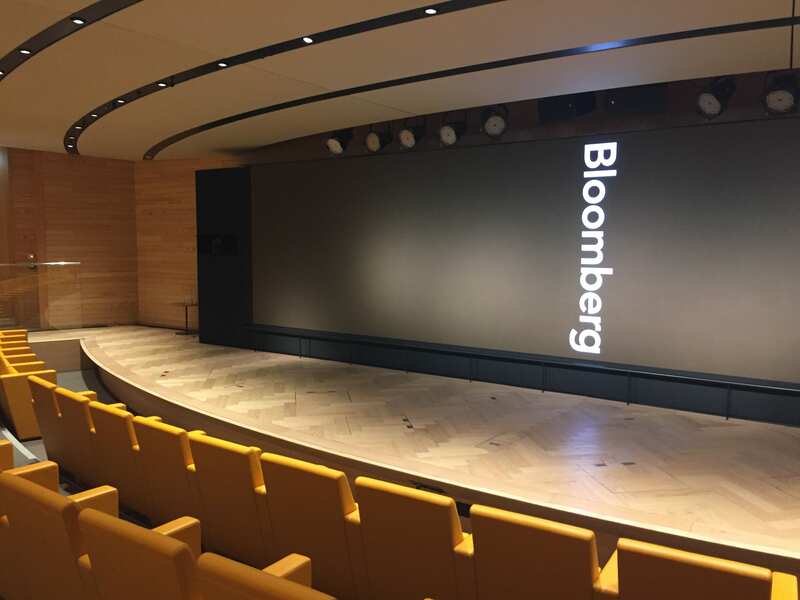 The University has contacts with Bloomberg because of its Business School, Cass.